What Are Cat Ketch Sailboats and Do they Make Good Cruising Boats? Do The Unstayed Rigs Of Cat Ketch Sailboats Really Work? Cat ketch sailboats are instantly recognizable by their tapered masts and total absence of standing rigging. There's nothing new about free-standing rigs though; they've been around for thousands of years - the Chinese Junk being the best known example. But we have Gary Hoyt to thank for developing these sailboats for modern day cruising boats. Hoyt, a former Finn Olympian and Sunfish World Champion, recognised that free-standing rigs would be just as successful on cruising sailboats as they were on his racing dinghies, and set out to prove it. 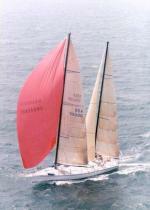 1977 saw the launch of Hoyt's Freedom 40 cat ketch, of which more than 90 have been produced to date. 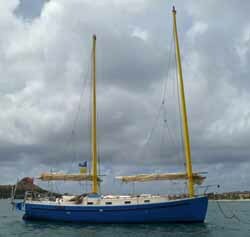 A cat-ketch Freedom 35 at anchor in Rodney Bay, St Lucia, West Indies. Hoyt's early version had aluminium masts, but the development of carbon fibre spars combining strength, stiffness and light weight enabled these sailboat designs to be brought really up to date. All unstayed masts are keel-stepped as they rely entirely on the cantilever thus provided by the deck for support. The mast is subjected to bending moment only, with none of the compressive forces that a stayed mast has to withstand. The flexibility of the rig means that it's impossible to get sufficient forestay tension to support a conventional jib, so any such sail is likely to be a blade type set up on a fractionally rigged forestay. More often than not headsails are dispensed with altogether and a single-masted cat rig or ketch rig used - the Freedom 40 being a notable example. 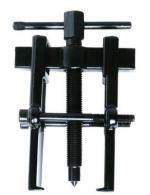 Either conventional booms or wishbone rigs are used to support the clew of the sail. The wishbone rig greatly reduces the risk of head injury from an accidental gybe - a valuable safety feature indeed on cruising sailboats of any kind. Aerodynamically this rig is very clean - few yachtsmen will lament the loss of the rigging-induced whining when it starts to blow, but it does mean there's less to grab hold of when up on deck. Running downwind is similarly stress free, with one sail out to port and the other to starboard. If the wind pipes up both sails can be eased forward, spilling the wind and steadying the boat. It's often said that they're less efficient to windward than the Marconi Rig (the Bermudan Sloop), but off the wind they make up for it. However, if you take a look at this this video of a heavily reefed 40 ft cat ketch sailboat overhauling a 48 foot cutter you'll have few doubts about their windward ability! Cat ketches clearly have a lot going for them!